The site of Maroulas in Kythnos is along the coast, close to the modern settlement of Loutra. Due to the sea level rise, possibly 50-60 m lower than the present, the greater part of the settlement has been destroyed. A rescue excavation at the site was initiated in 1996, which, after an interval of several years, has been reactivated since 2001. 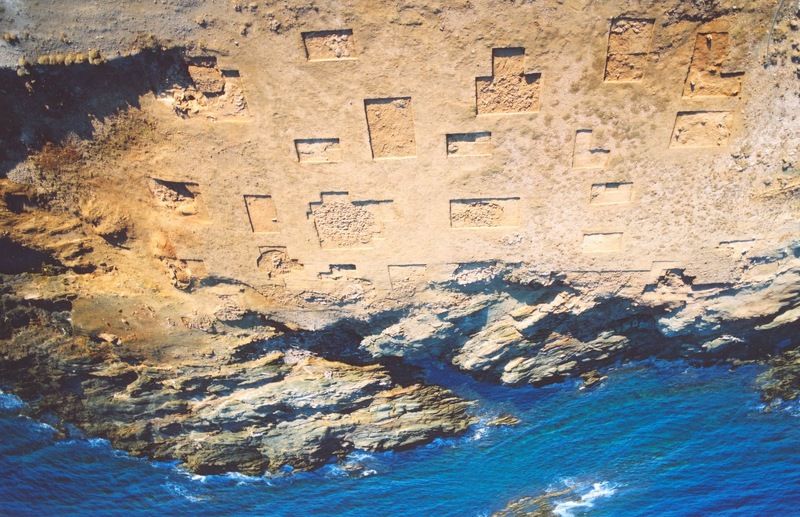 At various spots in the site, round constructions have been located, mainly in the eastern part of the settlement next to the coast. Due to intense erosion and the absence of deposits, constructions were considerably damaged. At the NE end of the site (Trench 2), a stone-paved floor of irregular dimensions was cleared, partly destroyed in the direction of the sea. The floor was constructed of large slabs and numerous small stones. In Trench 5, two circular constructions/floors have been excavated, almost adjacent to each other. Both of them were bordered by small stones placed in an upright position. Further to the south, in Trench 6, the remains of a circular construction approximately 3.20 m in diameter have been excavated. These small and large stones are usually founded on fossil soil cemented by epigenetic carbonates during wet episodes on the site. Totally, 31 circular constructions have been retrieved. The circular constructions of Kythnos find parallels to the Natufian culture that flourished in Syria and Palestine between 13,000 and 9,500 B.C. Possibly similar are the circular constructions of the pre-Ceramic phase from Cyprus, chronologically corresponding to the Mesolithic period in the Aegean. Some similarities we can also find to oval semi-dug structures of the early phase of Lepenski Vir culture (e.g. Vlasac, layer I, house no 2a), mainly overground constructions with a circular base and a rectangular hearth inside (Vlasac, layer III, houses VI and IX). 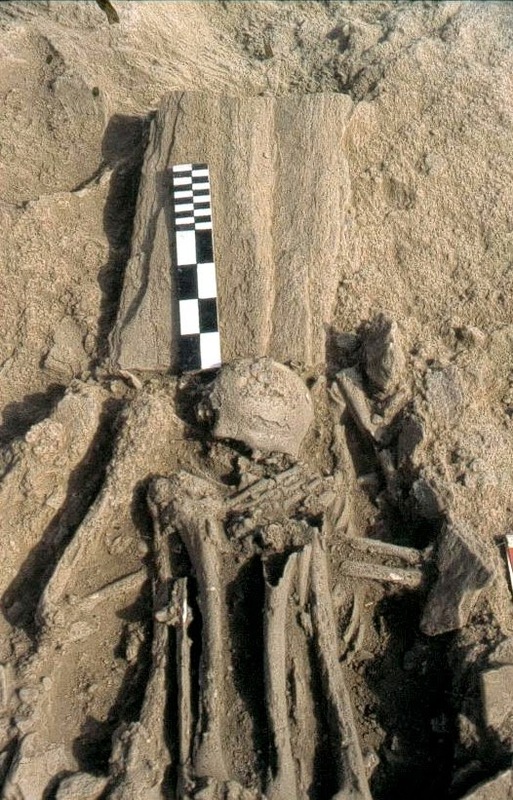 During the first excavation season of Maroulas, eight skeletons were recovered in a contracted position, characteristic for this period, at different points of the area. The dead used to be placed inside a rock-cut cavity or a pit, either slab- or stone-lined, and finally covered with large slabs. The most important find was a skeleton that was recovered in the northern part of the site lying on its back, but in a strongly contracted position, since the bent knees were drawn up to the shoulders. The arms were bent and placed on the chest. The skeleton has been preserved in a fairly good condition, although a hard rocky crust covered the bones. Αn other site with Mesolithic burials is Franchthi Cave in Ermioni, Argolid. Eight burials, with two cremations among them, were discovered at the entrance of the cave. All of them date from the Lower Mesolithic save one, which dates to the following period, of the Upper Mesolithic. Many other bone fragments and teeth date from both periods, and were recovered among abundant animal bones. These burials and the concentration of scattered bones belong to approximately 28 individuals. A burial yielded the intact body of a 25-30-year-old man, who probably died of a strong blow on the head. His skeleton lay in a semi-contracted position, in a N-S direction facing the East. Stones and a pile of terrestrial molluscs were placed on the body, while other stones surrounded the pit, in which the man was inhumed. Two of the burials, of a man and a woman, consisted of burnt bones cremated intentionally, as indicated by the condition in which skulls were found, exposed to fire, and the variable incineration of the longer bones, which were obviously covered by clothing. These constitute the earliest cremations in Greece. In Kythnos, marine shells have occurred in smaller quantities, while fish bones are also present. The majority of the shells belong to the patella species, most common in the Greek coasts. Animal bones have been scanty and mainly belong to small-sized animals still unidentified. Furthermore, the study of faunal material from the site, consisting of fish, birds, and mammals in less quantity, has shown suids (Sus scrofa) in early domestication. Recent radiocarbon samples assign fairly accurately the settlement and the cemetery on Kythnos to the 9th millennium B.C. (9346±67 B.P., 9571±65 B.P., 9440±40 B.P., 9420±50 B.P.). These dates of the Lower Mesolithic correspond to the ones already known from the Cyclops Cave in Youra, and Franchthi Cave in Ermioni. It is obvious that the people who inhabited Κythnos were orientated toward sea activities, notably fishing. At the same time, they were also involved in food collecting and hunting of small animals or birds, as the excavation has not yielded any bones from large animals. Moreover, it is possible that they did not settle permanently at Maroulas, but rather that they moved to different sites and islands. From the position of the island one can assume that Kythnos was part of a chain formed between Melos and the Greek mainland that related to the trading of obsidian (Melos – Kimolos – Siphnos – Seriphos – Kythnos – Keos – Attica – Argolid). Following this route, one could avoid the treacherous open sea from Melos to the eastern Peloponnese in the Myrtoon sea, especially in the case of Franchthi, where obsidian from Melos occurs since the Late Palaeolithic period. The presence of the obsidian at Franchthi from as early as the 10th mill. B.C. has been commented upon a lot lately, even though it has not been easy to speculate that the inhabitants of the cave actually had the necessary skills in order to travel to the open sea of the Myrtoon area so early. It is more safe to assume that the transportation of the raw material was carried out by Palaeolithic populations from mainland Greece, and probably also from the Cycladic islands, who cleared the ground for the later Kythnos inhabitants. The first occurrence of Melian obsidian at Franchthi corresponds with the warm Alleröd phase (9,800-8,800 B.C. ), which probably facilitated traveling and fishing in the Aegean. Fishing and seafaring activities at that stage suffice to prove that people had already started to turn to new systems of economy and adopt rapidly new diets based on sea resources as early as the 10th mill. B.C. Thus, apart from the sea route in the northern Aegean that united Thessaly with NW Asia Minor, the possibility of more sea routes in the southern Aegean must not be neglected. Further evidence of early navigation is the settlement of Crete in the 7th millennium B.C., by small groups of people who are assumed to have come from the East. However, the likelihood of people moving from the direction of the southern Peloponnese cannot be excluded in this case.It is certain that some traveling took place between the Aegean islands, aiming at visual contact, at least. Moreover, it is most possible that Mesolithic seamen would travel to the western Asia Minor coast. Therefore, similarities between the stone industry from Cyclops Cave on Youra and the corresponding one from Antalya in Asia Minor should not come as a surprise. The recent discovery of two Mesolithic sites in Ikaria, which bear striking resemblances to Kythnos, reinforces this view. Off the southern end of Euboea, the islands of Andros, Tenos, and Mykonos seem to form another geographical chain. Mykonos is visible from Ikaria and it would not be difficult for people of the time to cross this distance in good weather conditions. From there, the Asia Minor coast and the SE Aegean islands would be rather easy to travel to. All recent finds lead to the assumption that, at least, 10,000 years ago navigation activities in the Aegean were considerably more expanded than what we have previously imagined. A typical feature of this period is the engagement in intensive fishery. For the first time in the history of prehistoric archaeology, we know so many details about the circumstances of fishing activities among so early population groups, notably the cases of the Cyclops Cave on Youra, and Franchthi. On the contrary, very limited archaeological evidence is available of similar activities in Neolithic times. This can be accounted for by the fact that, although the Aegean Sea and, generally, the Mediterranean never ceased to be rich in fisheries, new economical tendencies have come about in the Neolithic period (e.g. cultivation, the expansion of herds, etc. ).